The Minister for International Development, Heidi Hautala on Tuesday said that the debate raised over her home renovation works and the cleaning matter would not hamper her activities as the minister. 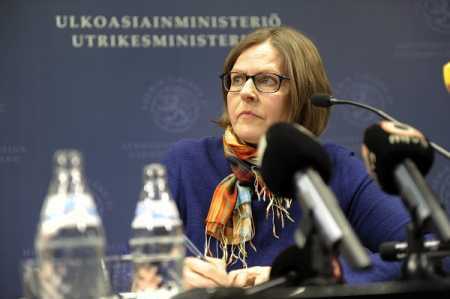 Speaking at a press conference at Helsinki, Hautala pointed out that she sought forgiveness for the controversial activities, although she did not gain any financial benefit from the renovation and cleaning works done in late 2009. Terming the issues as not much sensational, the minister, however, said that if the activities were harmful and tarnished the image of the governments, she would have preferred to resign from the post of the minister. She added that everything depends on the trust and she got spontaneous support from her Green party to continue as a minister. Hautala said that she already made an appeal to the Prime Minister, Jyrki Katainen in this regard and believed that under the present circumstances the issues would not be connected to her job as minister. She said that even she was not a minister at the time of the renovation works thus it should not put negative impact on the present status that she belongs to. The minister strongly supported the moral standard but in this case she does not think that a mistakes were not sheer breach of morality, although she learnt a lot from the mistakes. Earlier, Heidi Hautala on Monday denied to tell anything regarding the issues when she was asked by the journalists while speaking on a occasion to celebrate the opening ceremony of a new book of the Supreme Administrative Court president, Pekka Hallberg. The Green Party chairman, Ville Niinisto on March 16 said that Heidi Hautala would resign from the ministerial working group but will continue as a minister following the allegations raised against her. The decision of her resignation was disclosed by Niinisto, however, he said that the decision of resignation from the working group committee was taken by Hautala herself. Hautala is being widely criticized by the media concerning the activities of renovation, cleaning and pension bills matter. The criticism attributed to her alleging connection with black market. Earlier, the Prime Minister, Jyrki Katainen on March 14 said in Brussels that the minister for International Development, Heidi Hautala would continue as a minister despite the allegations raised against her. Katainen said that the criticism from the media would not affect the ministerial work of Hautala.